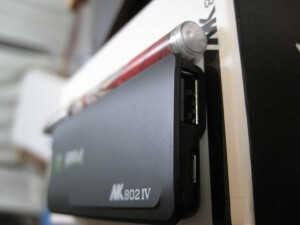 The MK802 series are mini computers the size of a usb key running Android, that connect to your TV with an HDMI cable. 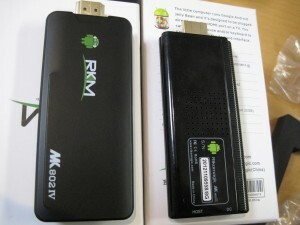 Rikomagic launched the trend last year with the MK802, a tiny device which, for less than $100, brought Android to your TV and could make it a smart TV out of the box. Many copycats followed, and these Mini PCs have since then improved in performance. The MK802 III released last year, with its Dual core CPU, made a huge difference, and turned what was just a funny geek trend into one of the best set top boxes out there. 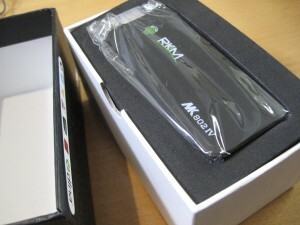 This month, Rikomagic released a new revision of their box, the MK802 IV. The MK802 IV is a bit bigger than a standard usb key, thinner than a pen, and roughly the same size as its predecessor, the MK802 III. In terms of design, Rikomagic are stepping their game up, as the MK802 IV is so far the slickest MK802 model ever, and will not look awkward in your living room (the same could not really be said of the previous models, which looks geeky in a nice way, but also cheap)… although to many of us that doesn’t matter much as it will stay behind your TV, so small that nobody will ever notice. But overall, let’s say this would make a nice present for friends or family who want to make their TV smart. The box includes an HDMI cable (which is not needed as the device already has an HDMI output, but is provided in case the dongle’s shape does not fit your TV’s layout), a mini-to-normal USB adapter, and an A/C adapter. The A/C adapter is a nice addition, as older models such as the MK802 III did not include it, and that caused some confusion from some buyers who would end up under-powering their device. The MK802 IV is the definition of plug and play. It will actually start as soon as it gets plugged in to the A/C Adapter (don’t forget to plug it with the HDMI into your TV too… some people seem to be confused with that and believe that the HDMI will actually power the device… that’s not true, you need to plug both the A/C and the video output, obviously). Booting time is under a minute, although it felt to me it is a bit slower to start than the MK802 III. Upon startup, no surprise here for people who know Android or who have used an android Mini PC before. 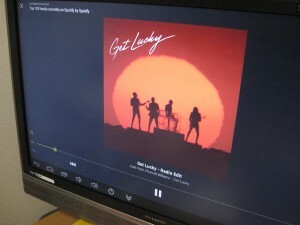 The main screen shows up nicely on your HD TV, with icons for the Browser, the Google Play Store, the device Settings, and a “file explorer” that you will most likely want to replace with the better “ES Explorer” from the google market. 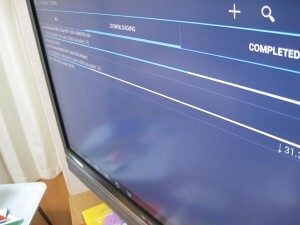 After a jump in the settings to connect to your Wifi router (the MK802 IV will also accept Ethernet cables through USB adapters such as this one), you’ll want to install a few essential apps to make the most out of your new Smart TV. 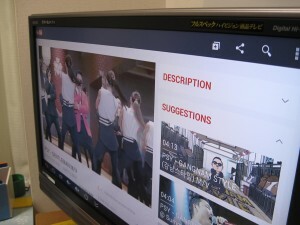 Youtube is a no brainer for these Mini PCs, and the first app we tried. It worked flawlessly (on firmware 4.1. On firmware 4.2 however, the wifi issues mentioned above made youtube almost impossible to use, with insane buffering times), playing videos in HD without a problem for us. No big difference here compared to the MK802 III, but a gigantic improvement if you’ve ever tried Youtube on single core devices such as the original mk802 or the raspberry Pi. MX Player is, as before, the best video player we’ve found out there for the MK802 IV, although, to our surprise, the hardware mode felt not as good as on the MK802 III. People have been reporting a bit of stutter on HD videos, issue that we did not notice in our tests. XBMC does work on this device, but it will require some sweat on your end. 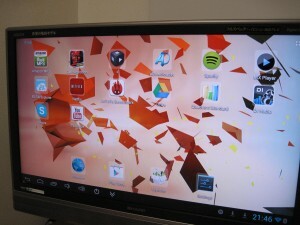 First, you’ll need to update the device’s firmware to Android 4.2 (it originally ships with 4.1) otherwise XBMC will crash on you. Updating the MK802 IV is quite a painful process, and we’ll try to have a nice how-to available in the days to come. Second, for optimal performance, you’ll need a custom Android build for XBMC, which uses the great library management functionality of XBMC with the hardware acceleration of MX Player. The “original” XBMC for Android will work (again, assuming you updated to Android 4.2), but without hardware acceleration, HD videos would be a “no go”. 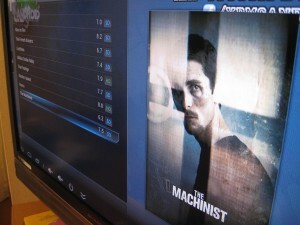 The XBMC + MX Player combination however works perfectly, and we’ll have a tutorial up for that pretty soon. The Latest version of Netflix for Android works perfectly fine on the MK802 IV (on firmware 4.1. On firmware 4.2, strange graphic glitches started to appear, and Wifi issues prevented us from watching anything in good conditions). 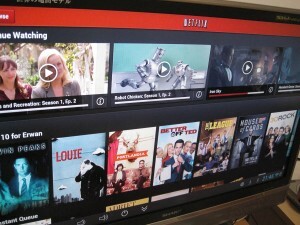 People who live outside of the US and want to access Netflix can do so by following the same tutorial we gave for the MK802 III: how to watch Netflix from outside the US on any Android device. 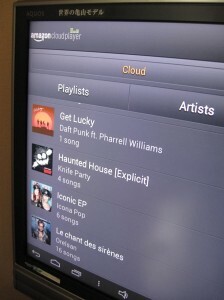 Applications such as Cubed (a music player with a nice a design), Amazon MP3, or Spotify work out of the box for your music player. Cubed really wins the design contest here, but I also like the fact that Amazon MP3 lets me play my music from the cloud… for spotify, people living outside of the US might want to try Unblock-US to access the service from any country. Games might be where the MK802 IV makes a difference with the previous MK802 Generation, but so far we only tested Carmageddon for Android, for a few minutes. The game ran smoothly, but I wouldn’t expect less as the game runs reasonably well on much older Android devices. Lots of people use the MK802 IV for retro gaming as well, but we didn’t test this. Knowing that it worked well on the original MK802, I am confident retro gaming will work fine with this device. 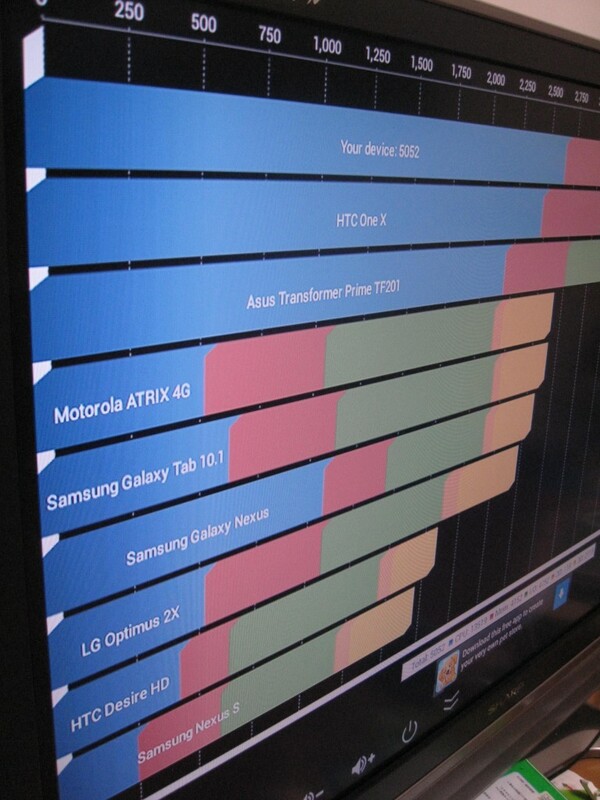 When we tried Antutu and Quadrant benchmarks on the initial firmware for the MK802 IV, they crashed on us and we couldn’t get any result. Updating to firmware 4.2 fixed the issues with Quandrant (not with antutu) and the performance results are below. Downloading through bittorrent with application ADownloader worked like a charm (not on firmware 4.2 because of the wifi issues), and we also used the device as an FTP server for the house using an app named Andreas Liebig’s FTPServer. We recommend both apps for the MK802 IV. In our tests, the MK802 IV runs perfectly fine with 5V and 1.2A, although it is recommended to use the provided adapter which outputs 2A as soon as you want to plug more than just a keyboard/mouse or air mouse to the device. 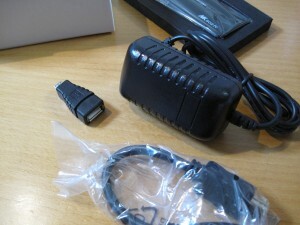 For example if you plan on using a usb-powered hard drive like this one, 2A will be needed. Which is ok, it still means the MK802 IV running for 1week will use less power than your air conditioning running for 1 hour! We’re talking of a device here that uses less power than your computer in sleep mode. When doing heavy use of the device’s CPU, we found it to be heating quite a lot. Not to a “burning” level, but noticeably hotter than the MK802 III. Even when doing nothing, or when being powered by the same 1.2A Adapter as our MK802 III, the MK802 IV was warm, to a point where I might not be confident living it on while I’m away, which was not a problem at all with the MK802 III. On that point it feels this is a bad point for the MK802 IV. The MK802 IV, out of the box, runs Android 4.1, and is an ok device, but nothing that impressed us compared to its older brother the MK802 III. 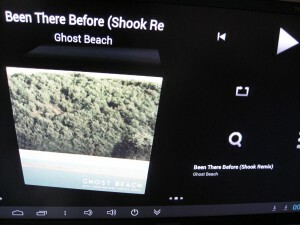 After an update to Android 4.2, added support for XBMC and for usb headsets/microphones could have made it a killer mini PC. Sadly that update shipped with Wifi bugs that make the device purely useless. Hopefully, Rikomagic will soon release a firmware upgrade that fixes the wifi issues, the only (big) problem preventing this from being the best MK802 ever. In the meantime though, we can’t recommend the MK802 IV, and suggest that you get a MK802 III , or MK802 IIIs instead, which are almost half the price today, and seem much more stable to us. You can read our review of the MK802 III here. Can this device output DTS and/or DD 5.1 sound to a receiver? How is the wireless performance? Could you bring up some tests with at least 5meters away from router. Sadly, as we wrote, the wireless performance is terrible since we updated to 4.2. No point in running those tests until the issue is fixed. Yes, but what about the speed in 4.1? Still as low as 0.7-2MB/s? I assume the heat issue was while running 4.1 and not 4.2? Just wondering since I’ve run into that issue on other devices when upgrading or changing ROM’s. Is there a chance to use the navigation buttons on the front as keyboard keys or is the whole front an IR remote? thanks for letting me know. thanks for this review of the MK702 II, appreciate it. I have bought the MK802IV together with the MK702II and I can confirm that it works well as an airmouse. I also have been in contact with Rikomagic support and in order to solve the 4.2 Wifi bug, they suggested moving the antenna (http://www.rikomagic.com/en/news/shownews_id_28_nid_5.html)and upgrading to firmware 0620 (http://www.rikomagic.com/en/download/download_22_1.html. After that connectivity was finally ok.
1) 1080p bug: playing 1080p movies is not smooth. Rikomagic support attributes this to a not better specified Rockchip bug and says that they are waiting a solution to then implement it in future firmware. 3) If I use the supplied 2000mA microUSB power adapter, after powering off from the Android control bar, the MK702II remote is not capable to bring the unit back on and and I have to manually extract and re-insert the microUSB power plug to start it again. Could you edit your post and insert the link for that adapter? I travel a lot and I can see this as being useful to have along, provided the hotel has updated and upgraded televisions in the rooms. Most catering to business travelers do though. Of course hotel Wifi often is poor at the best of times, so a direct connection would be necessary I suppose. My friend has a problem that he cannot watch any movies from his hard drive, sd card or internal memory. Movies are just like without codecs, on screen there are just colours of the rainbow and you can hear some cutted sounds. My question is – what codecs should he download, or how to solve this? Thank You guys for every attempt in helping him (by telling me;)). Greets! When will this be released. The XBMC + MX Player combination however works perfectly, and we’ll have a tutorial up for that pretty soon!!! Hi… I bought MK802iv after reading you reviews. I live in dubai and have been able to run netflix on all my devices here (after your tutorial on DNS:)). However netflix does not work on my MK802iv. It came preinstalled with android jelly bean 4.2.2 and I see video glitches when trying to run netflix. Can you please guide me on how to fix this? Thanks. Is the 4.2 firmware still not fixed? Good grief. Any alternative devices that y’all recommend? Hi, good review. Before I go order an MK802 IV, I hope you can confirm that it can power up the WD My Passport portable drive just fine. Thanks. Yes, it powers the WD My Passport ok (I have a 2TB) as long as you use a 2000mA A/C adapter (the one included in the package works fine for me). I made the mistake of order the Riko IIIS which was DOA, then I bought the IV, but it stutters on video playback with MX Player – even 320p video! That’s the whole reason I bought it – JUNK! Considering that users in Europe had Spotify long before it was available in the USA (more than 2 years before for us in the UK), there is no need to use Unblock-US for many users. Check if you’re in one of the regions where Spotify is available first before paying an Unblock-US subscription. I’m trying to make my SONY RM-EDO16 remote teach RKM MK702II how to behave. So far no luck, even though following the manual. Who can help ? Whether it is possible to control (? switching control method ?) 2 running PCs (= with 2 Logitech Unifying receivers – one can be purchased at Logitech for 10 EUR + shipping) from 1 Keyboard K400 in one room? This never (Logitech, Google, etc. ..) is not specified…. Today, you buy the MK802III, IIIS, or IV (with Android 4.2)?